This is a quote from Stephen Elop's first speech in Asia last week since becoming the CEO of Nokia. Cellphone producers worked with a Taiwan company that stands outside of Chinese governance, MediaTek, to quickly produce affordable and customizable cellphones that could flood markets within and outside of China. Essentially, cellphone producers dreamed of a way to operate outside of market regulations for cellphones and in the end shanzai phones now are estimated to makeup 20% of all cellphone sales within China. Millions of migrants can now have their dreams come true of connecting in real-time with friends and family, playing lots of games, going online, reading books, and taking photos - these non-elite users can finally afford cellphones just like anyone else in China. Shanzai culture is about equalizing the playing field for the most economically disadvantaged consumers. Now that is what I call a disruptive innvoation. Now companies like Nokia and Microsoft are panicking because they are unable to compete in the crowded smartphone market. Longtime buyers of Nokia feature phones (symbian) have defected to Shanzai smart phones in masses. But Nokia still has an odd split in their company - they’ve set their company up in China (and India, Africa) to be split into two parts: emerging markets and smartphones. And now Nokia smartphones are switching to Microsoft platform (good-bye Meego!). But this means that Nokia has segmented their market into two groups and made two assumptions - that emerging markets still want to buy feature phones and elite-users want to buy expensive smart phones. Sorry, but this isn’t going to work because both non-elite users AND elite users want access to really cool smart-phones. People in emerging markets are going to want to have access to the same features that expensive smartphones offer. They see the iPhone ads and they want the lifestyle that comes with it. So even if they can’t buy it from Nokia/Microsoft, iphone, or some Android phone - they’re going to get it a smartphone with the SAME features from a shanzai smartphone. Sure shanzai smartphones are cheaply made and it may fall apart in 1 year, but guess what - that’s more of an excuse to buy a new one. At such an affordable place, migrants can afford to get a new phone every year or so. My suggestion for any hardware manufacturer in emerging markets - learn more about your consumers. There are already companies that are ready to offer the 90% a very affordable smartphone. It is misleading to think that this 90% won't spend more on cellphones than they did on feature phones. Ahtough this 90% can't afford a smartphone now, it doesn't mean that they don't want one in the near future. It would've been more accurate for Elop to say, "previously, 90 percent of the world could not afford a smartphone or a high-end device, but we are going to see affordable smarpthones enter the market and users who will spend more on mobiles...This creates an opportunity." But I suspect that the reason why Nokia's CEO made his statement is because the market has yet to see the flooding of affordable smartphones. This is because Mediatek, the platform on shanzai phones, up until recently has only been able to offer 2G chips, not 3G chips. But Mediatek is beginning to produce Android smartphones with their 3G MTK6516 cellphone chips, the first affordable shanzai smartphone. And now that Mediatek has sorted out legal issues with Qualcomm in a a cross-patent liscensing deal, they are moving upmarket and ensuring that their 2G customers transition to their 3G handsets. So this means guerilla warfare on the smartphone market: Chinese cellphone makers will soon be producing smartphones that are much less expensive than the current array of smartphones ( i.e. iphones, HTCs, samsungs, and ericssons). Can Nokia and Microsoft together figure out how to fight guerillas and out-wit bandit strategy? In teaming up with Microsoft, a company who is also trying to figure out how to enter the smartphone, Nokia needs to make a decision: do they want to make mobiles for elite users or non-elite users? Does they want to compete with a handful of elite smartphone producers or do they want to compete with one really amazing company who just so happens to supply the 3G chips for a guerilla army of hundreds of smartphone manufacturers? In Nokia's transition from a hardware to software company, they have forgotten their mission: connecting people in affordable ways. If Nokia wants to return to their original mission and audience, they should focus on producing cellphones for non-elite users - the 90% that Elop refers to in his speech. In my research with non-elite users around the world, Nokia has always been at the heart of every conversation about cellphones. But I've noticed the decreasing ownership and desire of Nokia phones in the last 3-4 years, and it is even more apparent over the last year. The 3G market among non-elite users is already being created by current advertisement for high-end smartphones from iphone to HTC to Motorola. 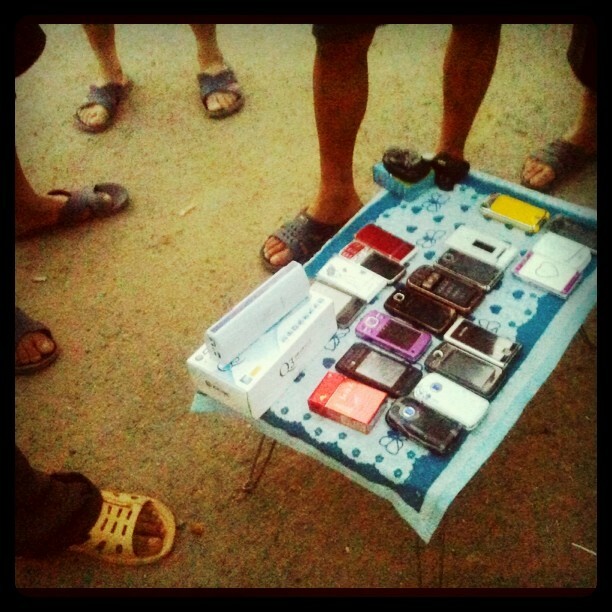 Cellphone vendors are selling 3G phones even in second hand cellphone markets. So even if non-elite users can't afford these phones, their desires for one are being nutured.High-end smartphones are paving the way for shanzai smartphones. I just spent several days with construction workers this past week. I hung out with them after work hours working as a migrant worker at a food vendor carts and wandering around nearby second hand markets. These markets offer items from clothing to shoes and to cellphones. Each of the cellphone sellers offered a range of shanzai feature phones, feature phones (Nokia, Lenova, and etc), and smartphones (open-android OS like Lenova, anycall). Construction workers make anywhere from 1500RMB to 4000RMB per month depending on their skill set. A used shanzai feature phone is usually around 50-100RMB. A used smartphone sells for around 800-1500RMB. This is a big difference, but if a younger worker don't have to support a family yet, he can afford to use a whole month's salary just on a phone. I noticed a lot of workers picking up 2G phones that looked like smartphones - such as the fake iphone. Even though I didn't see anyone purchase a 3G phone, I heard a lot of people asking questions about it and I saw people picking them up and turning it around in their hands, pushing buttons, playing games, and turning the music on. Essentially, they were interested but not ready to purchase. I spoke to the sellers and they told me that while they didn't sell that many 3G smartphones, but people showed a lot of interest in them. I asked one seller would even make the effort to put it on the table for customers to buy. He explained that having a few 3G phones on the table gives customers a broader range of choices to chose from. It makes customers think that he was a good seller who had access to "good and high-end phones," even if these phones were not within the budgets of his consumers. What's striking in the moment of observation is that cellphone vendors and users in the non-elite market are all quite aware that the "smartphones" were not ready for consumption at that moment, but they were anticipating the moment for a future date. It's like what department stores do with window displays - they put the most expensive product for display knowing that most customers can't afford it but want something like it. The younger construction workers I spoke to were "investigating" smartphones for themselves. Even if they coudn't afford it at that moment, they wanted the opportunity to play with the phone since the seller allowed people to interact with the phones. Many of them were saving up for a second hand smartphone that would cost anywhere from 300RMB to 1000RMB. The older construction workers just wanted a cheap feature phone, but sometimes I heard them asking about smartphones after they witnessed their younger counterparts inquiring about it and playing with it. A seller asked an older construction worker what kind of phone he were looking for, he said "one that can go online...look at video...I am giving it to my son." One younger worker picked up an imitation 2G Apple iphone. He didn't know how to use the touchscreen and move to the next page. The seller taught him how to swipe. Sometimes he swiped too slowly or too fast so the screen didn't move. He became frustrated with the phone and aksed to see another one. Younger worker: "Is this 3G thing fast enough for me to watch movies and videos?" Young worker holding fake 2G iphone, "How do I save music?" Question about battery life were the most consistent concerns that I had heard from all workers. All of them live in dormitory like housing and most of the time there aren't enough plugs for every person's phone at one time. Even with an extension cord, there aren't usually enough outlets. But most feature phones have longer battery life than smartphones. All the workers wanted a phone that they didn't have to charge everyday. Most people tested out the audio levels for music when they picked up a phone. Testing the phones was a very social process - workers had a friend or two with him. So there was usually a friend overlooking a worker's shoulder and they would discuss the features of the phones, like what questions to ask the seller or what functions to test out. A large portion of this 90% are read to buy smartphones not just because affordable phones will soon be available, but because the have the desire to own one. With costs for hardware and infrastructural barriers to 3G access decreasing there is going to be a major market shift very soon when shanzai smartphones become available. From advertisements to cellphones vendors, the techno-social lifestyle of owning a "good phone" is being created before our eyes. With Western & Japanese markets nearing handset saturaion, in next few years the mobile market is shifting to focus on this 90% - understanding their desires, needs, and daily life is absolutely necessarily for any mobile company who is going to develop services for them. It's going to be a few interesting years to see what happens in the smartphone market. Can established companies compete with these affordable smartphones? In terms of Nokia, the company really has some of the most brilliant researchers in their labs. They just opened another one in Shenzhen, China, the heart of shanzai culture. But Nokia doesn't have a technology problem, it has an institutional culture problem. Nokia's management needs to figure out how to let their researchers, programmers, & designers disrupt the entire mobile industry and hack apart the shanzai guerillas, or else the company may not learn how to take advantage of this "opportunity" that Nokia CEO Elops referred to in his speech.